In western Colorado, a red flag warning for high fire danger will be in effect Sunday from 11:00 a.m. through 9:00 p.m. for all counties along the Colorado-Utah border. Southwest winds will increase as a strong upper level low pressure system moves into the area, with gust up to 40 miles per hour predicted. 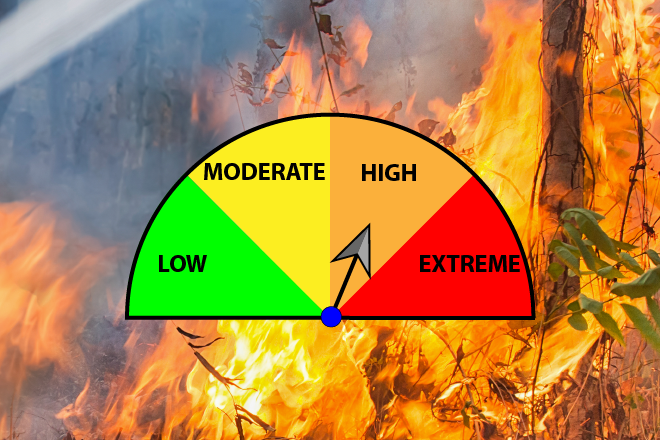 Low humidity - falling to as low as eight percent in some places - and dry fuel in the drought-stricken area will create critical fire conditions. Temperatures will range from the mid-70s to mid-80s, as much as 15 degrees above seasonal averages. The low will bring cooler temperatures to the area Monday. In southern Colorado, the San Luis Valley, and all or portions of El Paso, Pueblo, Huerfano, Las Animas, Crowley, Otero, Kiowa and Bent counties will be under a red flag warning from 1:00 to 7:00 p.m. The warning starts at noon for Elbert and Lincoln counties. Southwest winds are expected to gust up to 45 mph, with relative humidity dropping as low as nine percent. 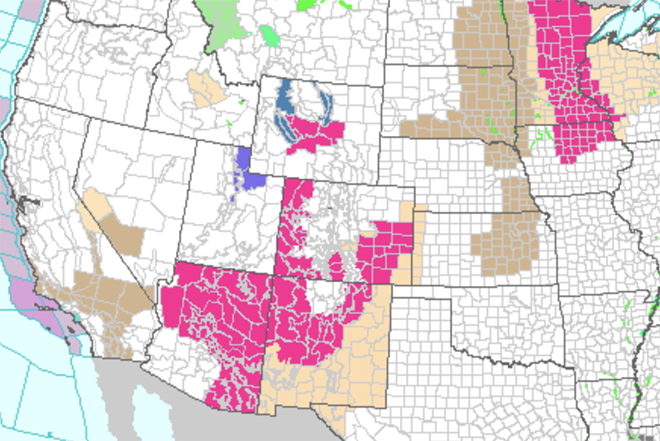 A fire weather watch covers the San Luis Valley and all of the southeast plains Monday. Sunday's near-record temperatures will be approaching 90 in Kiowa, Prowers, Bent, Otero, Crowley and Pueblo counties, with 80s expected across much of the rest of the area. Isolated strong to severe thunderstorms are also possible over the far eastern plains later in the afternoon. Wind gust from storms that do develop could reach 60 mph. Outdoor burning and other activities that could spark fire should be avoided over the next two days. If a fire starts, residents should be prepared to evacuate immediately.